Unite a trio of colorful peppers with marinated chicken for these Chicken Kabobs on the Grill. 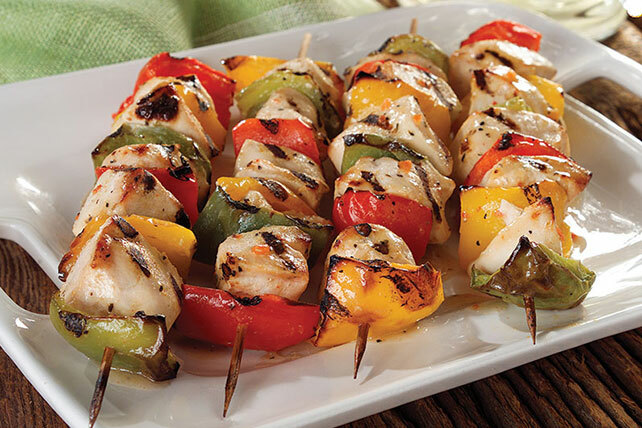 Marinate & baste these chicken kabobs with Italian dressing! Thread chicken and peppers alternately onto 4 skewers; brush with 1/4 cup dressing. Heat grill to medium heat. Grill kabobs 12 to 15 min. or until chicken is done, turning and brushing occasionally with remaining dressing. Prepare as directed, substituting sirloin steak for the chicken, and cherry tomatoes, onion wedges and mango slices for the pepper pieces, and increasing the grilling time to 20 min. or until meat is done. If using wooden skewers, soak skewers in water for 30 min. before using to assemble kabobs to prevent them from burning on the grill.